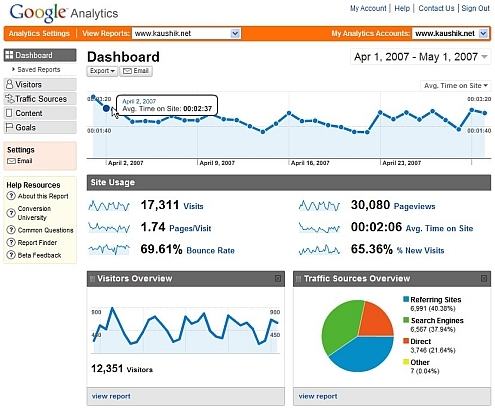 Google Analytics has been rebuilt and the result redefines the frontiers of doing analytics on the web. Avinash Kaushik has the definitive early review. I had the privilege of attending the launch and playing with the early release. Here are a few things I noticed. Speak my language: Google has put a lot of effort into replacing specialized terms with everyday ones. This makes the application usable by a broad base of people and is one way to fight GUI Jock-itis. Speed kills: The interface is easily reconfigurable and fast. I’ve long argued that interface speed is a substitute for configuration options. I’m curious to play with the tool and get a better sense if this is true. Flex rules: Much of the componentry for viewing data in Google Analytics is built in Adobe Flex. This is similar to Google Finance, and not at all like GMail or Google Reader, which use the GWT. We believe this has profound implications for analytical tools on the web and will dig into this in later posts. Newer PostWhy make 100 charts when one will do?